For Matt Paterson returning to the Hawks for a third spell at Westleigh Park feels a bit like coming home. 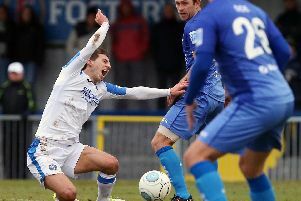 The 29-year-old striker signed from Welling United for the rest of the season. That move came about with the Wings suffering cuts to the financial budget. The Hawks were keen to boost their striker pool and made the swoop. Paterson said: ‘In some ways it is strange being back and in other ways it is like I have never been away. ‘Most of the same faces are still here and I always wanted to come back at some stage. ‘It came about because of the situation at Welling where they cut the budget. ‘I got in touch with Lee Bradbury about the possibility of coming back. ‘He was looking for a striker and agreed to the move. ‘The ideal scenario for me is to help the Hawks stay in the National League and get another contract with the club. Paterson first arrived at the Hawks on loan from Aldershot Town in 2014 when he made eight appearances without scoring. Then he spent the following season at Gosport Borough scoring 15 goals in 38 appearances. At the end of that campaign he joined the Hawks and in his two years at the club scored 17 goals in 75 appearances. He enjoyed the highs and the lows in his time with the club. Paterson was in the team that drew with Weston-super-Mare on the final day of the season that saw the Hawks relegated from Conference South. The following year he helped fire the Hawks to the Ryman League title and back into Conference South. Surprisingly Paterson then left and joined Oxford City. But on his return he couldn't have wished for a better start, scoring eight minutes into his debut at Boreham Wood. That goal set them on the way to a 3-1 win and three valuable points. The forward believes the biggest asset in their attempt to stay up is the team spirit. 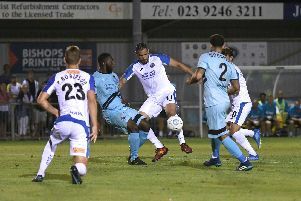 He felt that was shown in bundles during the 0-0 draw against Dover. The Hawks had to play three-quarters of the game a man short after defender Chris Robertson was sent off. Paterson added: ‘The camaraderie in the squad can be a real game changer..
‘There is a fantastic morale here. Tuesday night’s long midweek trip to AFC Fylde is postponed as the host club are involved in an FA Trophy replay. On Saturday, February 16 Wrexham make the trip to Westleigh Park for another important National League match.